Apoquel 5.4mg Tablets for Dogs are indicated for the treatment of pruritus associated with allergic dermatitis and the clinical manifestations of atopic dermatitis in dogs. 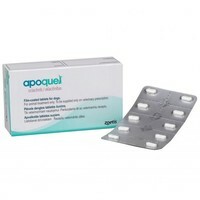 Apoquel 5.4mg Tablets contain 5.4mg oclacitinib. Tablets are great for my dogs allergies, good price to.